Why aren’t I feeling better? Desiccated thyroid is a natural hormone, made from the glands of pigs, that has been used for over a century to treat hypothyroidism. The first recorded treatment in North America was in 1891 by a woman who took it successfully for over 50 years. Until a synthetic replacement was developed in 1927, natural thyroid hormone was the only replacement medication available. Most conventional medical doctors do not use natural hormones as an alternative to synthetic chemicals, even if you haven’t had success with your prescription. After I radiated my thyroid, I was prescribed a thyroid replacement medication. I started on Synthroid right away, but it wasn’t long before I started feeling the effects of a thyroid gland that was no longer producing thyroid hormone. I tried the synthetic T4 thyroid replacement for several months before I finally understood that it wasn’t going to work for me. Though my conventional medical doctor and pharmacist tried to warn me not to try it, desiccated thyroid works MUCH better for me. Natural thyroid replacement is taken from the gland of animals, usually pigs and sometimes cows. 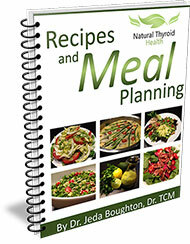 It contains T4, T3, T2, T1, iodine, and other minerals essential for your thyroid to function properly. Unlike synthetic medications, animal thyroid products give you the full spectrum of hormones needed to balance your thyroid. This works so well as a replacement because it’s easier for your body to absorb and utilize the bioidentical hormone than it is with a synthetic replacement. Desiccated thyroid is freeze-dried and powdered for use as a natural hormone replacement. It works by replacing thyroid hormones that your body doesn’t make on its own. Armour Thyroid is one of the most common brands of natural thyroid hormone replacement prescriptions and has been in use for decades. There are little to no side effects, and it’s safe for children, adults, and the elderly. Bovine glandular thyroid is desiccated thyroid made from the glands of cows and is similar to those made from pigs. Like all natural thyroid replacement treatments, it contains T4, T3, T2, T1, iodine, and other minerals that help your body replace what’s missing. How do I switch from Synthetic T4 to Desiccated Thyroid? Levothyroixin is prescribed in micrograms (mcg), and desiccated thyroid is prescribed in milligrams (mg). A common dose of 75 mcg of synthetic T4 is roughly equivalent to 60 mg of desiccated thyroid. Therefore, as a general guideline you can multiply your T4 dosage by 0.8 to get a starting dose of desiccated thyroid in mg. For example, if you are taking 100 mcg of Synthroid, multiply 100 by 0.8 which gives you 80mg and you can start with that dose. You don’t have to gradually reduce your dose of Levothyroixin, you can simply stop your old medication and start taking the new hormone replacement. Once you start the new medication, it is important to monitor your symptoms to be sure that the dosage is right for you. Some people are on a very high dose of synthetic hormone, and the equivalent dosage in a natural replacement can be way too high. Before starting a new medication, consult with your healthcare provider about natural thyroid hormone replacement strategies. my daughter is 12yr old and has TS. she’s got some hair loss. she has 1 patch about 5cms by 3cms and anoehtr 1cm round patch. She’s been diagnosed with alopicia areata. She saw a dermatologist 3 weeks ago and has started on a steroid lotion to see if it helps.Hair loss is a bit more common in women with TS although still it does not happen too often and is very rare in children with TS. With my daughter they are thinking it’s her immune system attacking the hair follicles.My daughters thyroid function is fine, it always has been she takes no medication for that. She started estrogen treatment about 8 months ago, oxandralone aged 8yrs and growth hormone aged 4 years. The alopicia started about 2 yrs ago but the hair grew back after 6 months, then about 1 yr ago came back in the same place but got bigger and showed no signs of coming back.Luckily she has really thick hair so the patches are not seen, she can’t have her hair in 2 pony tails or french braids though as it can be seen then. but down or 1 pony tail and it’s not seen..She had a blood test done with her last yearly blood tests to see if there was any reason for the loss but all tests came back normal. I guess we will just have to wait and see if the hair comes back or not Was this answer helpful?